Founded in 1980, International Expeditions offers small-group, soft adventure experiences to many of the world's most exotic locations. These include land-based trips to places like India, Ecuador, Costa Rica, Nicaragua, Panama, Patagonia, Uganda, Madagascar, Indonesia and Borneo. 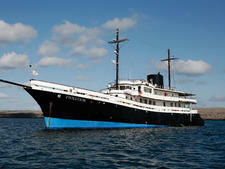 Its cruise-focused program operates in the Peruvian Amazon and in the Galapagos. For these trips, passengers can add on land-based journeys to Machu Picchu, the Inca heartland and Peru's Northern Andes. International Expeditions' reputation lies with the exceptionally well-trained and knowledgeable staff of naturalist guides and expedition leaders, all of whom hail from the region. In addition, the company invests heavily in community building in the regions in which it cruises; on the Amazon, for instance, IE has contributed water purification systems to villages throughout the region. Independent Expeditions is based in Helena, Alabama. It has partnerships with travel and environmental organizations that range from the World Wildlife Federation to Smithsonian Journeys. The company is owned by the mighty Tui, one of the world's largest travel and touring conglomerates. Sister companies under the Tui banner are Quark Expeditions, which specializes in polar cruising, and Zegrahm Expeditions, which offers small-ship trips in exotic regions. At 32 passengers, Evolution boasts an intimate ambiance, but never feels stifling. It's also a perfect blend of luxurious and laid-back. Though primarily a land-based travel company focusing on exotic destinations, International Expeditions operates two cruise ships: Amazon-based La Estrella Amazonica and Galapagos-based Evolution. 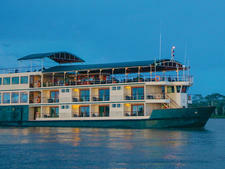 La Estrella Amazonica, which debuted in 2013 and carries just 31 passengers, is the only riverboat plying the Amazon to feature private balconies in all 15 of its cabins. Other distinctive features include the largest sun deck of any ship trawling the region and a superb Amazon immersion program that targets natural and cultural wonders. Informal to its core, the ship is comfortable, even though it lacks in some of the more contemporary amenities typically found on riverboats, such as interactive televisions, in-cabin minifridges, Wi-Fi access and a variety of dining options. On La Estrella Amazonica, the focus is on learning about, and then experiencing, the Amazon region from a variety of vantage points. The modern ship is simply laid out, with two decks of cabins, a dining room, a lounge that also serves as a lecture room, and a sprawling, covered sun deck/bar area. There's also an open-air lounging deck with chaises for sunbathing. The ship is air-conditioned, and all cabins have beds that can convert from twins to a king. They each have armoires, desks and nice private bathrooms that offer glassed-in showers and even windows. One cabin accommodates three people, and there are two solo cabins. Meals served onboard reflect their locale, mostly focusing on hearty Peruvian fish and chicken dishes. (A vegetarian option is available at every meal.) Wine, beer and soda are available for a fee. With most entertainment and enrichment taking place on shore and in various tributaries via comfortable skiffs, motorboats that can seat up to 18 people apiece, the highlight of most evenings was the crew band's performance of various Peruvian and Amazonian folk songs, along with the occasional interloper (like The Beatles or Simon and Garfunkel). A new addition for International Expeditions in the Amazon is a fleet of Hobie kayaks. On 32-passenger Evolution, expect a similar experience onboard, although programming, dining, entertainment and enrichment are oriented toward the Galapagos region. Snorkeling, swimming and hiking are mainstay activities, so this trip is somewhat more active than the Amazon cruises. Cabins on the recently renovated ship range from 143 to 263 square feet (alas, none with balconies). On the plus side, some differences include an outdoor dining area and a hot tub on the sun deck. A full-time doctor is available only on Evolution. International Expeditions' cruise adventures attract a wide variety of passengers, from active retirees to families with children. It has a strong affinity for solo travelers. For instance, on Estrella Amazonica, in addition to the single cabin, the company dedicates four standard doubles with no additional single supplement to solo travelers. Because its cruises focus on intense enrichment and experiential immersion -- our Amazon trip included a chance to fish for piranha, worship with a shaman and paddle kayaks -- IE's typical passengers are curious, well traveled, well educated and recreationally inclined. The company's fleet of two ships consists of 31-passenger La Estrella Amazonica, which plies Peru's Amazon River all year, and 32-passenger Evolution, which is based in the Galapagos.